How should I play saryn now??? This comment was posted to reddit on Dec 17, 2014 at 2:49 pm and was deleted within 11 minutes. Yay, its my Time to shine. 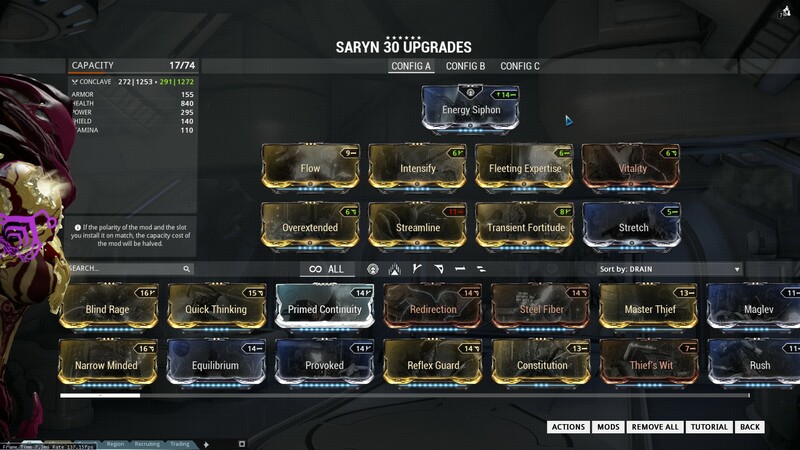 I'm the Saryn expert of my group and I've been playing her for most of the time through most updates ever since Founders, I'm currently MR 17 as well. With the release of Transient Fortitude Saryn became a monster, now that you can get below 75% duration you can get a giant amount of bonus damage without stacking any Power Strength. At 75% Reduced Duration you deal the full Miasma damage in 1 Second, however, if you would deal the full Miasma Damage in theoretically half a second (Which would be at 87,5% duration Reduction) It rather than just hitting once for the normal full damage doubles since the initial skill damage always applies for a whole second. This also means, that the further you stack your negative duration, the more damage you gain. A total of: 92,5% reduction, which means you reduce the initial 4 seconds of the skill down to 0,3 seconds. Next up is the rest of the build, with the recent release of energy Regen mods and weapons (Red Fail & Teflon Soda mods/weapons) you can basically specialize on using 25 energy long range Ults on a regular basis, as long as your team mates fill your weapon exp bar. You end up with a Giant Range ult, that will 1shot anything up to T4 Survival at 25 minutes for 25 energy. You will literally regenerate more energy than you can spend with a competent (And incompetent) Party, simply due to the Nature of the Syndicate weapons, this is even more insane if you have an exp booster Running, since it causes the Syndicate Mods and weapons to Proc twice as quickly. Just started. Kinda boring, does it get better? Has anyone seen invasion Catalysts/Reactors since Nightwave started? How To Ask Someone To Leave Your Squad. Account Suspended for -1050 Platinum. REALLY DE?! has anyone else had an issue with warframe uninstalling itself? (xbox) Ivara breaking Prowl using bullet jump turns out to be an intended change rather than a bug. Someone went out of their way to get Semlar's Riven Tracker accounts banned Warframe Choice for 60 minute Kuva Nightwave Understanding the Chat Moderation Scandal and the community's hunt for blood Understanding the Chat Moderation Scandal and the community's hunt for blood Rahetalius uploads a video giving a rundown of the entire Chat Moderation scandal, in turn gets accused of "personal attacks against DE staff" on Twitter by Steve, Rebecca, Megan and Pablo. Warframe Weekly Q&A | Ask Your Game-Related Questions Here! What if arbitrations were shorter but faster? This might be the worst sortie chain I've seen in the last two years. Clock of Eidolon 2.0 - rewritten in React.js and hosted on Github and Firebase!